named in memory of our long-time visionary, mentor, and friend. 2018 scholarships were awarded to Mia Kyler (Riverheads) and Margot Flanders (Wilson Memorial), with each receiving $500 in order to pursue their college careers. 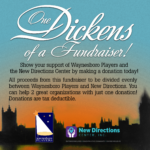 These young people have been very involved with Waynesboro Players for several years and both have outstanding theatrical credits from other organizations as well. Lillian would be very pleased to see the passion and talent that Mia and Margot bring to the Performing Arts.